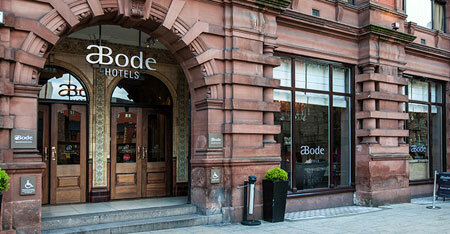 At the ABode Manchester Hotel in bustling Piccadilly, Cafe Bar and Grill is a chic, stylish stop for international cuisine. At the ABode Manchester Hotel in bustling Piccadilly, Cafe Bar and Grill is a chic, stylish stop for international cuisine. As well as boasting outdoor dining, the adjoining Lounge Bar completes the dining experience, with a relaxed atmosphere. The Cafe Bar and Grill menu offers a huge selection, catering for every time of day or appetite. Home baked pastries, freshly cut sandwiches and paninis, and lightly tossed salads for vegetarians are perfect light bites. Hearty mains like local meat and fish platters are popular choices, and gourmet fine dining is found in the Goosnargh duck and Herdwick lamb fusions. Local and imported beers, freshly squeezed juices and smoothies, and an exciting cocktail and wine list are served at the Cafe Bar and Grill restaurant. An eclectic menu and superb evening entertainment make Cafe Bar and Grill at AbodeManchester ideal for any day of the week.